We have a large selection of products to help people with low vision, macular degeneration, retinitis pigmentosa, glaucoma and cataracts regain their visual independence. 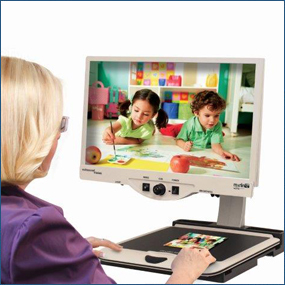 Our low vision electronic magnifiers are designed to assist you in many different low vision situations. Some are portable while others are designed to sit on a desk or table. 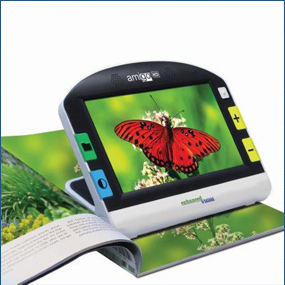 The Merlin family, Acrobat family, Amigo and the Pebble are our most popular low vision electronic magnifier devices. To get all of the details, please select one of the low vision product families below. Otherwise please visit our complete low vision product line page. Merlin is a desktop low vision device designed to be set up in a fixed location. It is primarily used for reading, writing and hobbies. 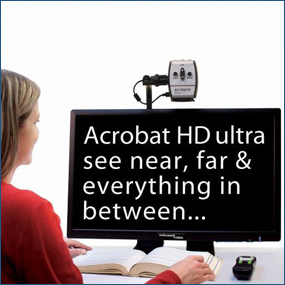 Acrobat is a transportable low vision magnification unit. It is used for seeing yourself up close, reading and viewing things at a distance. The Amigo and Pebble are battery powered low vision protable magnifiers and are great for in the home or around town. Quickly read a bill and write a cheque! To view the complete Enhanced Vision product line please visit the full low vision product line page.